Mother’s Day is all about mom, and your child is excited to spend the day with you. There are lots of activities to do with your little one that will make the day together more special. Try a new craft, game or family activity. You may find there are plenty of things to do that are affordable, encourage creativity and learning, and bring everyone together for an afternoon. Try starting a new family tradition by planting flowers with your child on Mother’s Day. Choose flowers that grow well in your region and are easy to care for. Have your child help you dig, pot and plant them. 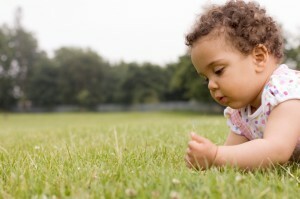 Touching and playing with the soil will be a sensory rich experience for your little one. This activity will also allow them to explore and learn about the critters living below their feet. 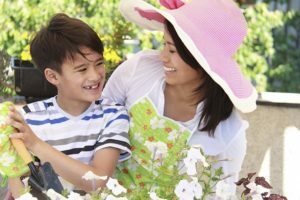 Once you’ve completed planting, talk to your child about taking care of the flowers. They may want to help you water and care for them throughout the summer. Create a sheet of questions (and space for your child to fill in the answers) about you. This is a fun way for your child to learn more about being a mom, your interests and hobbies. Plus, you may get a laugh out of some of your child’s responses. Feel free to get creative with your questions. Ask things such as, “what does mom do during the day?” or “what is mom’s favorite activity to do for fun?” This is a good game for preschool children and kids in early elementary grades. Go out on a bike ride or play a few rounds of tennis, whatever mom likes best. Being active together encourages family bonding and gets some endorphins flowing. Begin by ordering copies of your favorite family photos and locate some thick paper or poster board. Allow your child to get creative with this project. They can cut out the pictures in different shapes and sizes and paint them onto the posterboard with child-friendly glue. To make the project more interesting, add colored pieces of tissue paper and draw designs using markers. Check out these great ideas for celebrating Father’s Day with family activities. Find fun outdoor activities for kids and tips on how to plan a family outing.